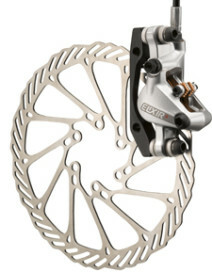 Avid’s latest addition to its program is the Elixer R hydraulic disc brake. Avid has created more stopping control with the development of the Taperbore technology and improved pivot location. The new pivot location enables less initial power, and deep stroke modulation, allowing the rider to better manage and use the increased overall power. The Elixir R design eliminates the need for an independent reservoir, leading to a new sleek integrated brake lever. A positive side effect to the integrated reservoir is major weight reduction. The Elixir R weighs 20 grams less than the current Juicy 7. The super stiff, two-piece caliper containing larger pistons give the Elixer R more stopping power. The newest member of the Avid hydraulic brake family provides more heat resistance by incorporating the new two-piece caliper design and DOT 5.1 brake fluid. The Elixir R features a tool-free reach adjust allowing the lever to be adjusted for various sized hands perfectly. The sintered brake pads are now loaded from the top, so it takes only seconds to replace them. The Elixir R is also compatible with a variety of SRAM triggers and/or the RockShox Pushloc remote to create a more elegant and refined cockpit.